Two female figures squatting or kneeling in full skirts, their arms are draped over each other's shoulders. The right figure's head is missing, and the left figure's right hand is partially missing. A small child, dressed, leans across the two women's laps. National Archaeological Museum, Greece. January 26, 2015. http://www.namuseum.gr/collections/prehistorical/mycenian/mycenian07-en.html. Tronchin, F. Flickr.com. January 29, 2015. https://www.flickr.com/photos/frenchieb/5923563236/in/photolist-owjKKq-a2rNYC-a2rNCS-aCJEa8-aCMmqh-bxx7RB-7PVGQS-7PSqGX-eZGGxZ-njwmcm/. Image is licensed under a Creative Commons Attribution-NonCommercial-NoDerivs 2.0 Generic (CC BY-NC-ND 2.0). 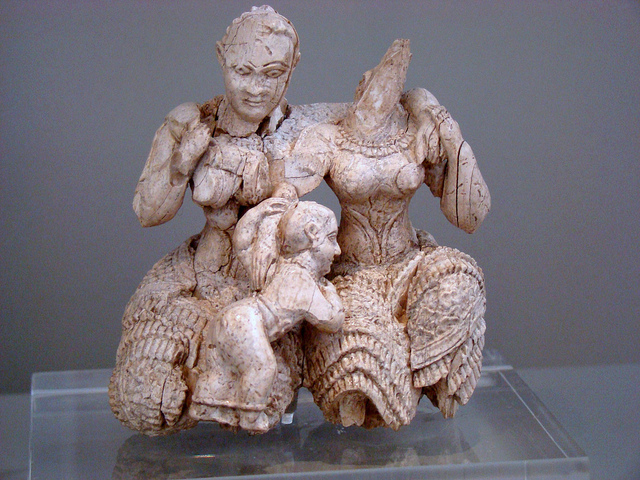 Unknown, “Ivory Figurine,” Introduction to Art History: Mapping the Movement of Men and Materials, accessed April 24, 2019, http://arthist101.dukewired.net/omeka/items/show/43.